An exasperated Matt Underwood of SportsTime Ohio let out the preceding utterance after Brett Anderson dropped a 78 MPH curveball in for a strike on Cleveland’s Brent Lillibridge with a 1-1 count in the bottom of the third inning Monday. Even by that point it had become a familiar sight for Underwood and the hapless Indians. 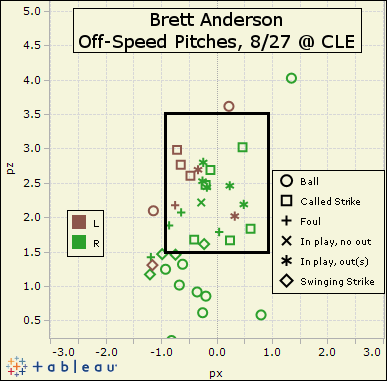 All told, Anderson used his off-speed trio — curveball, slider, changeup — 42 times, and 27 of them went for strikes. Lillibridge struck out swinging on a 2-2 curveball biting down and in. He was one of five strikeout victims and one of 13 straight retired by Anderson to open the game. The positively svelte Anderson cruised through seven shutout innings, continuing to look the part of staff anchor just as the club needs him most. When Anderson is able to reliably spot his breaking stuff for strikes early in the count, it puts hitters in a terrible spot. Either they find themselves down in the count and forced to chase — see the four swinging strike diamonds just outside the bottom left corner of the zone — or they find themselves angling to hit a diving slider or curveball. Anderson’s pitches — including the fastball — have so much downward bite that even when solid contact is made the ball dives groundward almost with a mind of its own. In no at-bat was the dominance of Anderson’s control and movement more apparent than his fourth-inning strikeout — demolition, perhaps? — of Shin-Soo Choo. Anderson finished off Choo so fast the Navy Admiral in the Indians’ booth didn’t even get to finish his story about Top Gun. On all three of these pitches we see an impressive amount of movement, as if Anderson sealed a shady pact with gravity itself. It’s enough to keep enough bats missing and to keep what contact is made anchored to the earth. Between his first two starts, his impressive stuff, and his pedigree as a prospect, there is more than enough evidence to believe Brett Anderson can be more than just an adequate Bartolo Colon replacement. Anderson looks primed to become the best pitcher on this Oakland staff down the stretch — perhaps one of the best in the league. We hoped you liked reading Brett Anderson Ascends Via Descent by Jack Moore! Should Angels Pick Up Haren’s Option? Watching Anderson pitch is usually one of the few highlights in an A’s season. This year, it’s just a cherry on top. A lovely, groundball getting cherry.